Hollywood celebrities, trial lawyers, and Clinton administration alumni are rushing to underwrite the candidacy of Mike Espy, who is vying to capture a U.S. Senate seat for the Democratic Party in Mississippi. Espy, the first and to-date only African American to lead the Department of Agriculture, garnered nearly 40 percent of the vote in the Nov. 6 special election to determine the remainder of former Republican senator Thad Cochran's term. Running in a crowded field that pit members of all political parties against one another, Espy came in second behind incumbent Republican senator Cindy Hyde-Smith, who was appointed to the seat in March upon Cochran's retirement. Since no candidate was able to garner more than 50 percent of the vote, both Espy and Hyde-Smith advanced to a run-off to be held later this month. Espy's second-place showing and the prospect of a run-off, where turnout is likely to be lower, has ignited Democratic hopes of snagging another Senate seat in the deep South. Those hopes have resulted in a flood of support and campaign contributions from the legal and entertainment professions aligned with the Democratic Party. In the week between the special election and Nov. 15, Espy's campaign raised more than $250,000 in part due to out-of-state donors like Chelsea Handler and Lorne Michaels, the producer of Saturday Night Live. Both Handler and Michaels have donated $2,500 to Espy's campaign since the primary. Handler, who backed a bevy of losing Democratic congressional candidates this year, has been particularly active in boosting Espy on social media. Espy's campaign has further received donations from Hollywood celebrities like Jeffrey Katzenberg and actress Nancy Stephens, among others. The candidate, who himself practiced plaintiff's law prior to running for the Senate, has received significant support from trial lawyers. Shortly after the primary results became clear, the American Association for Justice, the nation's largest association of trial lawyers, donated $5,000 to Espy's campaign through its affiliated political action committee. The Democrat's campaign has also received donations from some of the most prominent trial lawyers from California, New York, and Florida. Espy's reliance on out-of-state donors ahead of the run-off isn't surprising, especially considering his campaign has done so throughout the race. Prior to the primary election, Espy raised more money from outside of Mississippi than any other candidate—Republican or Democrat—running, according to the Center for Responsive Politics. Donors in heavily liberal metropolitan areas like Washington, D.C., New York City, Boston, and Chicago furnished more than 70 percent of Espy's campaign contributions. In comparison, Hyde-Smith has raised approximately 62 percent of her campaign donations from individuals in-state. Lucien Smith, the chairman of the Mississippi Republican Party, told the Washington Free Beacon out-of-state donors were flocking to Espy because his record indicates he would be a reliable vote for the Democratic Party. "Mike Espy was a liberal member of Congress, a liberal member of the Clinton cabinet, and he is now being supported by out-of-state liberals because they know he would be a solid … vote they can rely on in the U.S. Senate." Apart from receiving support from traditional Democratic groups, Espy's campaign has been heavily underwritten by the high-ranking Clinton staffers and cabinet officers with whom he served. Robert Rubin, a former CitiGroup executive who was President Bill Clinton's Treasury secretary, has cut two checks, each totaling $2,700, to Espy's campaign. Similarly, Harold Ickes, Clinton's former deputy chief of staff for policy, has donated to the effort in recent weeks. Apart from making a monetary contribution, Deval Patrick, who served in the Clinton-era Department of Justice before ascending to the governorship of Massachusetts, has journeyed to Mississippi to campaign on the candidate's behalf. Clinton, himself, came out of the woodwork in November to headline a fundraiser for Espy in New York City. The former president did so, albeit previously admitting he was "troubled" by the controversies that triggered Espy's departure from his cabinet. In 1994, less than two years after being appointed to head the USDA, Espy resigned amid allegations of improperly accepting gifts and misusing federal resources. A particular sticking point for the White House was the disclosure that a food industry giant, which the USDA was weighing action against, had awarded a scholarship to Espy's then-girlfriend through one of its nonprofits. The allegations, serious enough to warrant an independent counsel, resulted in Espy's indictment on 30 criminal charges in 1997. Although he was eventually acquitted, a jury found that Espy had accepted gifts from groups with business in front of the USDA, but prosecutors were unable to prove the gifts resulted in any preferential treatment. Espy's campaign did not return requests for comment. Melissa Scallan, a spokeswoman for Hyde-Smith's campaign, told the Free Beacon it was unfair for the media to ignore Espy's long ties to the Clintons, especially while paying so much attention to an offhand joke the senator recently made to a group of college students. 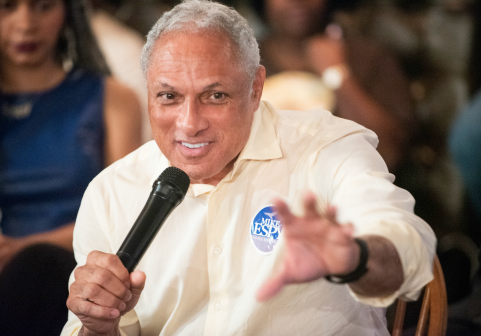 "This is just more evidence that Mike Espy is the most liberal … person ever to run for the U.S. Senate in Mississippi," Scallan said. "The people donating to his campaign are nothing more than Clinton cronies who want to see him elected so they can push their … agenda." The runoff election will be held on Nov. 27. This entry was posted in Politics and tagged 2018 Election, Democratic Party, Mike Espy, Mississippi, Republican Party, Senate. Bookmark the permalink.